Self Published with Lucid-Ly, 2012. 157 pp., 66 illustrations, 33 four color and 33 duotone, 10½x8¼". 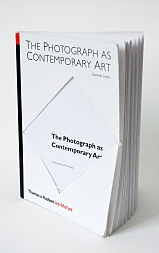 The Photography as Contemporary Art had been a project in the making for nearly 2 years working with the Dutch design Studio Kummer & Herrman, resulting in a uniquely handmade book entirely from stickers. Each book has 66 hand-placed stickers inside from the photomontage series of the same name. Each book takes the artist over 3 hours to finish and is signed with the exact time and date of completion. The Special edition is boxed with 1 sticker removed from the book and placed onto paper as if to replicate a print, there are 33 editions only.